I like how the book’s text mimicked the familiar rhythms of the Clement C. Moore poem — but always with a twist. The stockings were hung. The trees were cloaked. The gifts were wrapped, and the kids were stoked! The author dedicates his book to Clement C. Moore (and to Dr. Seuss, and to South Pole explorer Ernest Henry Shackleton, as well as his own children and parents…) And it turns out that much of the book’s action does take place near the South Pole, as an explorer named Mr. Bones reminisces about his encounter with the one-eyed Santa creature. 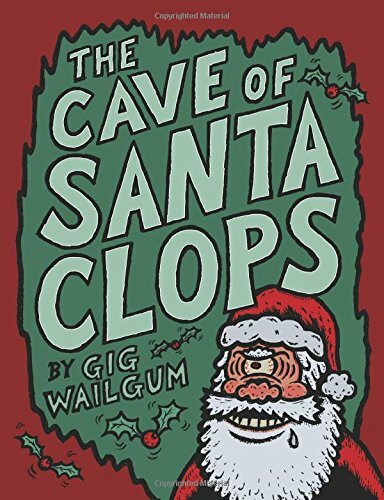 But that book was set at the cozy home of the narrator, whereas this one leads us to Santa Clops in his very own lair! It turns out that Santa Clops flies in a sleigh pulled by penguins — who can fly because Santa (Clops) feeds them each a magical fish. Odysseus Bones stows away on the sleigh, but soon he’s tumbling through the sky in a shower of coal dust. Santa (Clops) wheels his sleigh in (for an attack?) But in the end, he just wishes his pesky stowaway…a scary Christmas! My friend Elliott — an H.P. Lovecraft fan — says the book was fantastic! And it’s always nice when a book’s author is also its illustrator. There’s some special care in the layout, with multiple drawings often inset inside of a single page. And even when the children ask questions, the text is drawn inside dialogue balloons over their head. It may not be the perfect book for every single child — but there’s definitely some naughty little boys and girls who will think this book is terrific!